Measuring only 86mm by 86mm, Embest SBC8530 Single Board Computer provides a high-performance and highly-integrated single-board solution to support using in various applications such as navigation systems, media player, medical patient monitoring devices, industrial test and measurement devices, industrial vision and portable communication. The SBC8530 Single Board Computer is with small form factor and uses POP (Package on Package) CPU/Memory chip to interface the 1GHz DM3730 processor to 512MBytes of Nand flash and 512MBytes of DDR SDRAM. 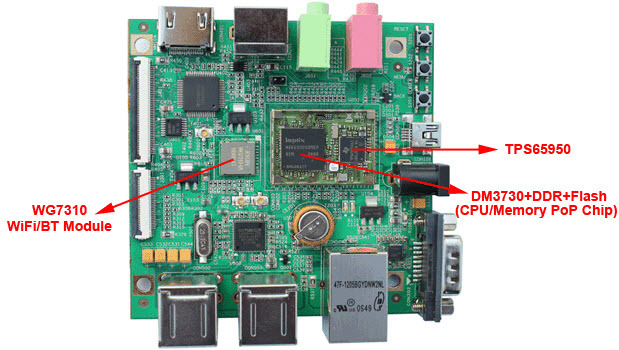 The board has exposed many interfaces including serial port, USB, Ethernet, Camera, Audio, LCD, Touch screen, DVI-D, S-Video and etc. It also features a WiFi and Bluetooth module WG7310 on board to enhance the wireless network functions. On the rear of the board there is a TF card slot to extend the storage capabilities as well as an expansion interface to allow user's development extension. The board is able to support for Linux 2.6.32 and WinCE 6.0 operating systems. It is provided with complete software BSP, the drivers of which are many in source code. The board has two methods to boot the system and you can boot the board from either TF card or NAND Flash. Besides, it is provided with Android 2.2 demo with driver source code. Embest gives instructions on how to boot Android demo image from NAND flash with TF card. If user purchases the complete configuration of the SBC8530 Single Board Computer, the deliveries will include the SBC8530 board and all necessary accessories and user manual, schematic drawing, datasheet documents, software BSP in one DVD. This enables users to quickly start their own development based on this platform. The board is preloaded with Linux OS in NAND flash and WinCE OS in TF card. User can display the system by using a 4.3" or 7"TFT LCD and Touch screen or using a DVI-D monitor with an HDMI to DVI-D cable, or using a TV for NTSC or PAL video display. Additionally, Embest offers various functions modules for SBC8530 including VGA, WiFi, Analog Camera, 3G and Digital Camera modules which greatly extends the functions of the board and would be flexible for customer selection to meet their own needs.